The intrepid singlehand debacle of the fire balsa: Good morning, Favela. Like in Ancient Greece, city councilors in São Paulo took part in the sacred and confusing procedure of Ostracism earlier this year. Much like the Ancient Greeks, Forty Six São Paulo city councilors looked around quite nervously and asked themselves in a room without cameras whether or not they should like to find something guilty among them. The unanimous opinion was in the affirmative. "Oh yes, something must take the fall." Keeping to Greek tradition, the city councilors etched names into broken pottery. These names belonged to things they thought were quite deserving of blame and expulsion from society. 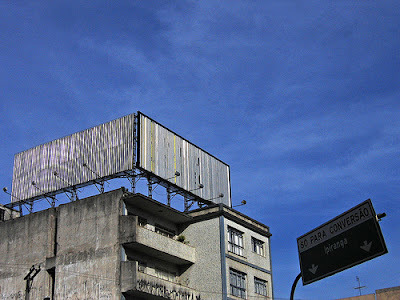 Advertisements were rounded up and expelled from the city of São Paulo. This city of 11 million people, one of the largest cities in the world, is a city without advertising. For years, the advertisements in São Paulo not only propagated the hyperreal but physically obstructed the real. Billboards stretched across the tops of highway interchanges and advertising agencies would often offer cash settlements to poor homeowners for rights on their gardens or walls. With the advertisements gone, the rusted out structures that formerly housed them now stand as frames for the backgrounds they had masked. 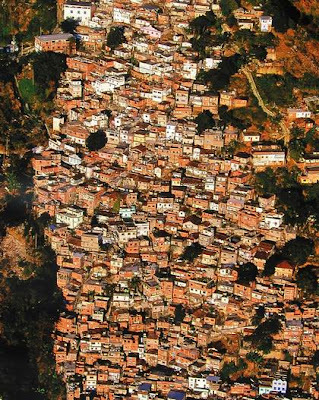 The cascading favelas of São Paulo sprawl naked now! billboard graveyards. The first photograph is his. Posted by Greg at 6:45 p.m. In some of those pictures, the billboards would have covered windows... trees... I'm sure a lot of people are happier now - if not poorer from no big-business money. Happy people are a happy thing.